Our little dust-up 8 years ago has apparently festered into the impression I “dive-bombed” his house, when of course I was following the existing Noise Abatement Procedure, and even exceeded the then 800? Above Ground Level (AGL) restriction (it’s now 1,000? AGL). Since then, the Zwecks have sold their property to Boulder County and are receiving a sum of $250,000 a year for 20 years followed by a $5.12 million payment at the end. Might as well buy their vegetables, you’re paying for them one way or the other. 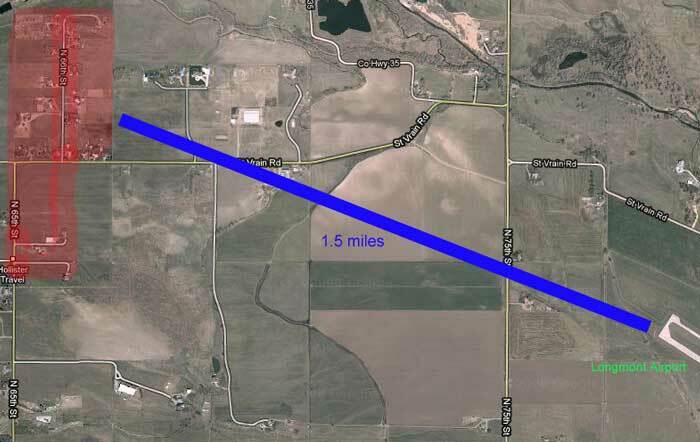 That land was bought for Open Space and to continue the St. Vrain Greenway – like most Open Space that we continue to pay for, it’s not exactly open to the public. Yet the endless complaints continue, there is no placating or appeasing in this situation. 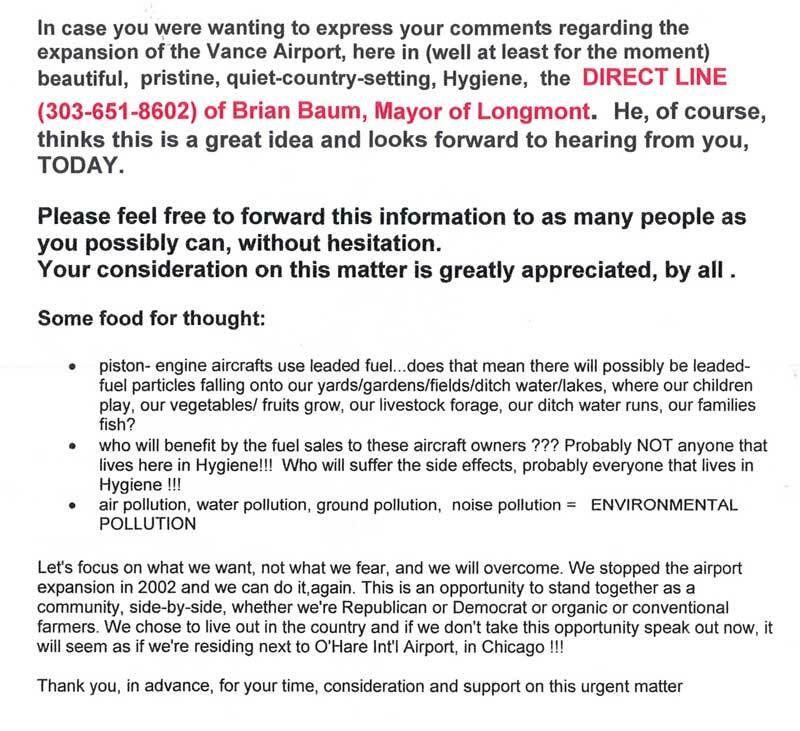 And then there’s the issue of the neighbors west of the airport, again, not Longmont residents or taxpayers. These homes are on 65th and 66th Streets and are 1.5 miles from the existing end of the runway. 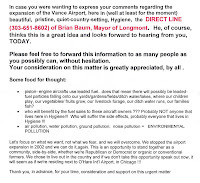 In the flier below (click to enlarge) where they talk about “beautiful, pristine, quiet-country-setting, Hygiene” they don’t seem concerned that they polluted the area with these fliers and that they not only aren’t in Longmont, they aren’t in Hygiene either! Based on two Times-Call Open Forum letters, the wording and style appear to be from a Mindy Eckhardt. In one of her letters, she had her stomach turned by the thought of more lead coming from jet fuel. Oddly, the flier said lead from “piston- engined aircrafts“. Somebody must have educated her to the fact there is no lead in jet fuel. Two of the three aircraft (the main two) from the airports largest operator, Mile-Hi Skydiving, are turboprops that use jet fuel. But since she errantly brought up lead, a majority of the piston aircraft actually can fly on automobile gas (MoGas), which of course is unleaded – as in, has no lead. But aviation gas (AvGas) actually leaves behind a smaller carbon footprint than regular old unleaded car gas. Look it up, I already did. That’s pretty close to an active, and potentially expanding, runway. One that was there long before they were. Yet they are pulling out all the stops, including the ever popular class warfare. See how many times anti-airport types say “corporate executives“, “CEO’s“, “select few“, “corporate welfare“, and “heavy duty suits“. Nevermind these homes and the land they sit on are more expensive than most homes in Longmont. They got theirs, to hell with the rest of you, and to hell with the possibility of economic development for Longmont. Why should they care about that? There’s always the option of putting their property up for sale if they’re so concerned. Don’t forget to make the potential buyers aware of how horrible it is. Then again don’t bother, it’s public record. I didn’t realize they were talking about expanding the airport. That is great news. I guess you have to expect the anti-airport types to start running at the mouth again. You would think you could ignore people that buy property by an airport and then complain about the planes. As you say, they do make more noise than the airport, and for some reason, people listen to them.